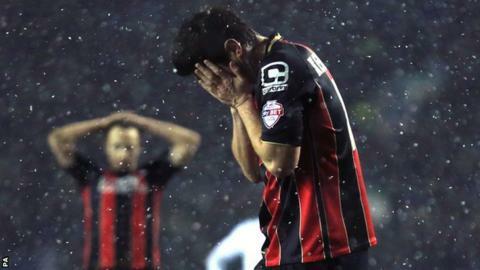 Bournemouth boss Eddie Howe said Yann Kermorgant's missed penalty was not to blame for the Championship leaders' 1-0 loss to Leeds on Tuesday. Kermorgant hit the bar with his 86th-minute spot-kick as struggling Leeds earned a vital win. "It was a great opportunity to get a point and maybe more but it summed our night up that Yann didn't take that chance," Howe told BBC Radio Solent. "There's no blame attached to him, it's the way it goes with penalty takers." Kermorgant, who famously missed a 'Panenka'-style penalty for Leicester in the 2010 play-offs, has scored eight goals for Bournemouth this season - including two penalties - but was off target at Elland Road. Howe said his team had done enough in attack to have deserved to win the match. "We had a number of chances and on another day we'd win that game. When you come to Elland Road and create that many chances, you'd expect one to hit the back of the net," he said. "We had a bad start to the game, Leeds put us under pressure and we didn't deal with that pressure very well, giving the ball away which is very much not like us. "It was a day where we didn't play as well as we can do but we still should have won the game. "We know that at this level, if you're not at the top of your game you'll get punished and we were by a great strike." Bournemouth beat Rotherham 2-0 on Saturday to bounce back from their defeat by Norwich in their previous outing. "We came here in really good spirits and full of confidence on the back of Saturday's win," said Howe. "I don't think there were any thoughts that we wouldn't physically be where we need to be, but the game probably showed we weren't our usual bright and bubbly selves. "Leeds is a tough place to come when you're not at your best, and we gave them a leg up with how we started. The crowd got behind them and our gameplan was to do the opposite."